This is a story about adaptive reuse, unplanned obsolescence, and the way one building can straddle two centuries and come to embody the fickle nature of commerce in a modern American city. The hulking, Mayan-inspired, Art Deco monolith originally known as the Western Furniture Exchange and Merchandise Mart has stood on its Market Street block between Ninth and Tenth streets for 81 years now. Completed in the summer of 1937—the same year as the Golden Gate Bridge—at a cost of $3 million and after just one year of construction, the massive showroom complex for wholesalers and manufacturers of home furnishings, carpets, lighting, drapery, appliances, and radios was never intended to be a public space. It was a space where out-of-town furniture retailers and industry tradespeople came together for seasonal trade shows, and where professionals in the world of home decor could comparison-shop the latest styles and technologies, room by room and floor by floor. A full nine floors of showrooms, to be exact, totaling over 600,000 square feet at the outset. Of course, before the internet, all shopping had to occur in person or by catalogue, but buildings like this sprang up in major American cities (an even larger Merchandise Mart in Chicago has also seen some recent adaptive reuse) because of the synergies that existed within this particular industry, and the mutual benefits of bringing home furnishing vendors together in one physical location. 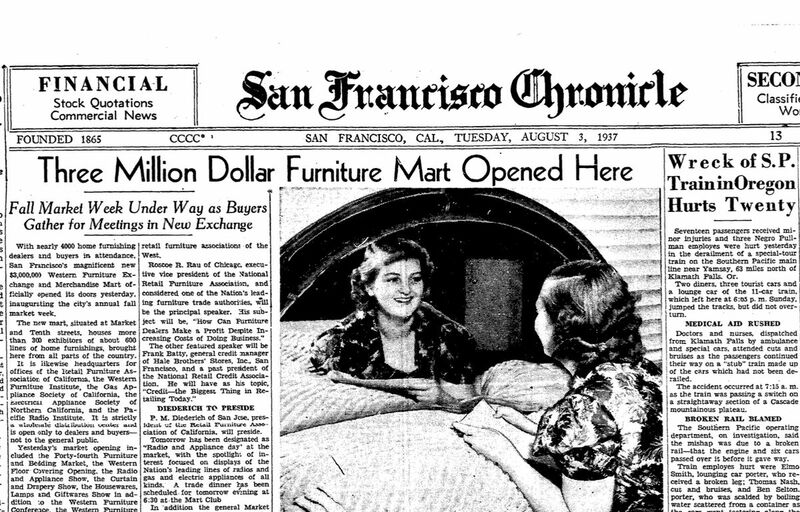 The opening of the Western Furniture Exchange and Merchandise Mart lands on the front page of the San Francisco Chronicle. This is in sharp contrast to the grand vaudeville and movie palaces designed by big-name architects that lined Market Street in the era when the SF Mart was built, including the grandest of them all, the spectacular Fox Theatre designed by Thomas Lamb, which stood directly across the street. The Western Furniture Exchange and Merchandise Mart was, after all, just another steel-framed, utilitarian commercial building to arise in an era of many such buildings, and the Deco detailing and grand lobby space were aimed to attract a small segment of the population, as opposed to dazzling the masses. 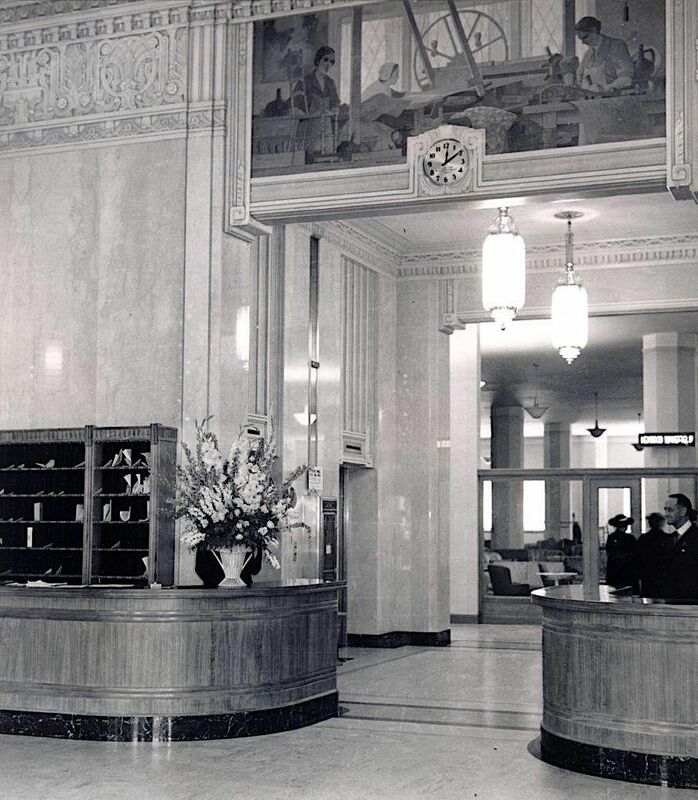 1937 photo shows lobby of the Western Furniture Exchange and Merchandise Mart shortly after opening. To lovers of Art Deco, though, the L-shaped building’s sculptural terra cotta details are anything but boring monoliths. The three street-facing facades of the building on Ninth, Market, and Tenth streets feature intricately beveled columns made of sand-colored terra cotta tiles which are broken up with Mayan-Deco friezes and grandly sculpted grate work that hovers over each of the multiple entrances. The front of the “penthouse” structure on the Mart’s top floor was originally home to radio station KSAN, which had a large broadcast antenna there as well. And for several years, the Mart Club restaurant and auditorium toward the western side of the building also included an outdoor patio which would soon get covered over and repurposed as a warehouse. 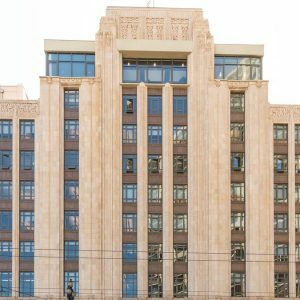 A Shorenstein Company representative thinks the roof deck, which would later become a primary feature of Twitter’s offices here, may have been covered over due to SF’s frequently chilly weather. And in building the warehouse there during World War II, when steel and concrete were under ration, the owners used old-growth Douglas fir instead—wood that would later be reclaimed and reused as paneling throughout the latest incarnation of the lobby and multiple other floors, as designed by BCV Architects. Kitchen exhibit at the Western Merchandise Mart in 1947. The Western Furniture Exchange and Merchandise Mart would go on to see renovations and new additions multiple times over the years. Only 10 years into its existence, in 1947, booming post-war business drove the owners to acquire neighboring parcels along Ninth Street that would become the extended wing that turned the once rectangular floor plate into an L shape, adding roughly 220,000 more square feet of showroom space. This appears to be part of the original structure because the exterior detailing perfectly mimics the same Mayan-Deco motifs. 1958 would bring a further expansion of the 10th floor, adding more showroom space to the eastern end of the building and expanding the existing penthouse, giving the entire structure, set back from the original, an International Style facade. Yet another floor would be added, the 11th floor, on top of this structure in 1963. 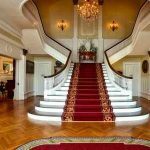 New York’s ADCO Group bought the building in this era and ran the furniture showroom operation for the next five decades. In 1974 came the addition of Mart 2, an entirely new building facing 10th Street along Stevenson, designed by local San Francisco architect Jorge De Quesada. Despite some pushback by at least one Planning Department commissioner over the patterned concrete cladding of the building (it featured just small, two-foot-square windows in order to preserve the quality of the showroom lighting within), the new building was approved, and by mid-1975 added another 400,000 square feet of showroom space to the SF Mart complex, which now totaled well over 1 million square feet. The two buildings were connected by bridges on each floor over Stevenson Street from the 2nd to the 10th story. The building’s front exterior in 2019. Yet another lobby and ground-floor renovation would take place in 1989, but in the ensuing two decades the Mart fell into near-total obsolescence. Only 30 furniture and housewares wholesalers remained in the complex in 2008, down from 300 in 2005, shortly after the semi-annual industry trade show moved to Las Vegas’s 5 million-square-foot World Market Center. Physical showrooms like these were now mostly the purview of very high-end furniture markets, which had already moved into boutique spaces at the SF Design Center and its adjacent Design District in SoMa. Owners ADCO had already considered creating condominiums on the building’s upper stories, but instead they began work to transform the building into office and retail space. 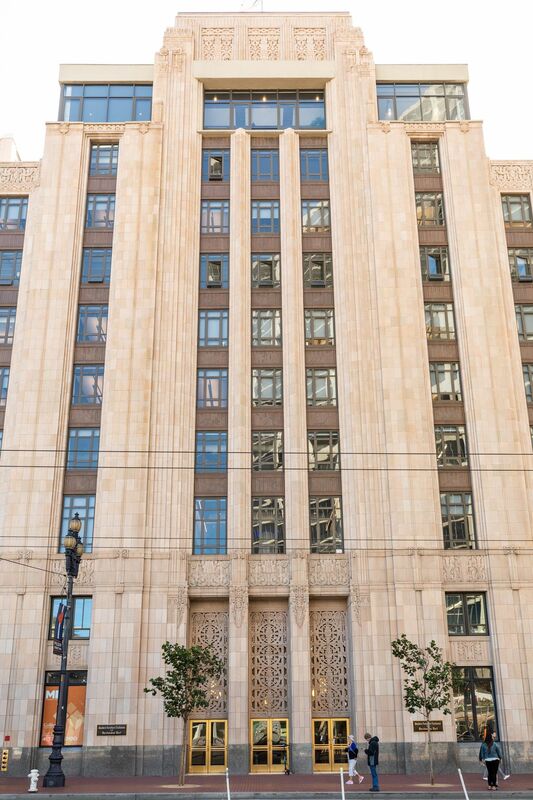 It would be another couple of years before the Great Recession was over, and tech companies like Twitter were ravenous for big office floor plates in central San Francisco locations like this one. The Shorenstein Company stepped in to purchase the SF Mart and Mart 2 from ADCO in 2011, for $110 million. 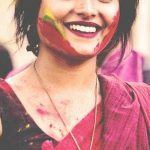 They also jumped on at a point when Twitter, under the lure of a tax break, was already well into negotiations for the three floors of the building they would ultimately lease. Thus would be born Market Square. People sitting around fire pit in Market Square Plaza just outside Twitter headquarters. Also of note in the lobby of 1355 Market is an art piece by sculptor Chris Edmunds which repurposes many of the brass mailboxes that were once part of a massive bank of mailboxes belonging to the building’s many tenants. 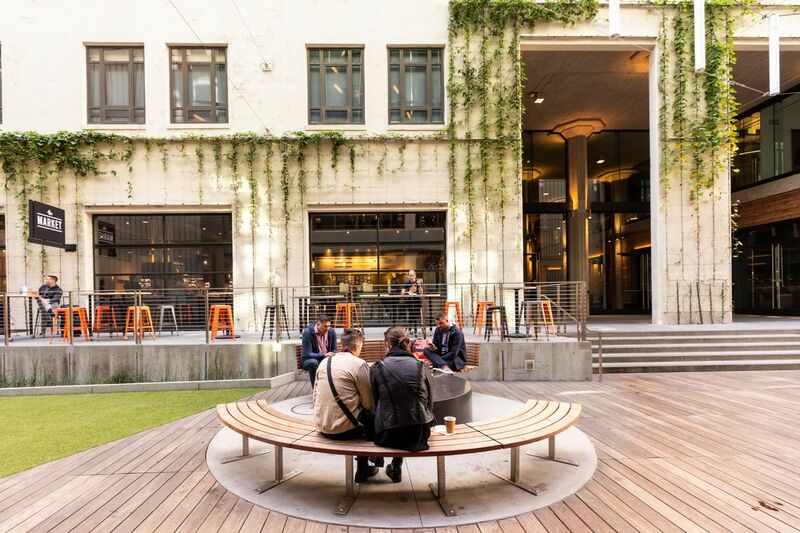 As for those ground-floor businesses, the retail portions of the complex have been less of a success story thus far as the Mid-Market neighborhood remains in the thrall of its decades-long transition. 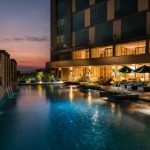 The Market on Market, a local knockoff of Whole Foods, and the bustling location of Fitness SF in the 1 Tenth building both remain popular with the building’s workers and residents of nearby residential complexes like Nema. But the massive restaurant space that was briefly home to the French-inspired brasserie Bon Marche facing Market Street has yet to find itself a sustainable tenant. Likewise, the equally ambitious Dirty Water, a beverage-focused restaurant and bar at the rear of the building, lasted a couple years longer but closed in July. Meanwhile, along the Ninth Street side of Market Square, the Cadillac Bar and Grill appears to still be going strong with its pitchers of margaritas and platters of nachos. In 2015, we learned that Shorenstein was quietly shopping around Market Square for $800 million, and by August of that year, they had succeeded in selling a 98-percent stake in the building to Barclays, retaining just a 2-percent stake. As of that year, that put the value of the building at $937 million (remember how it cost $3 million to build?). 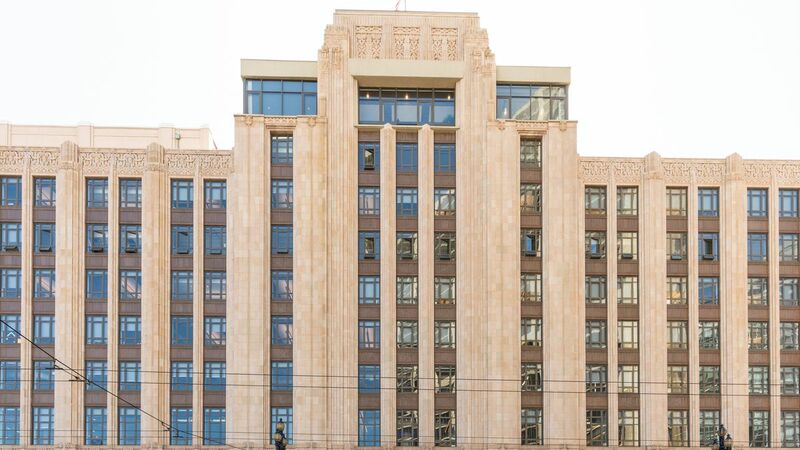 While Twitter is still the majority leaseholder, other tenants in the building have included Microsoft-owned social network Yammer and high-tech incubator Runway. From being a central location of the West Coast’s home furnishings industry, and a “physical internet” of appliances and housewares, the Western Furniture Exchange and Merchandise Mart lost its usefulness in part because of the internet. But, by 2014, the place was home to one of the cornerstone businesses of the new internet, Twitter, where cheap jabs and memes are exchanged in place of physical goods. It’s a very San Francisco story. And just wait—with a building this massive and immovable, it’s far from over.